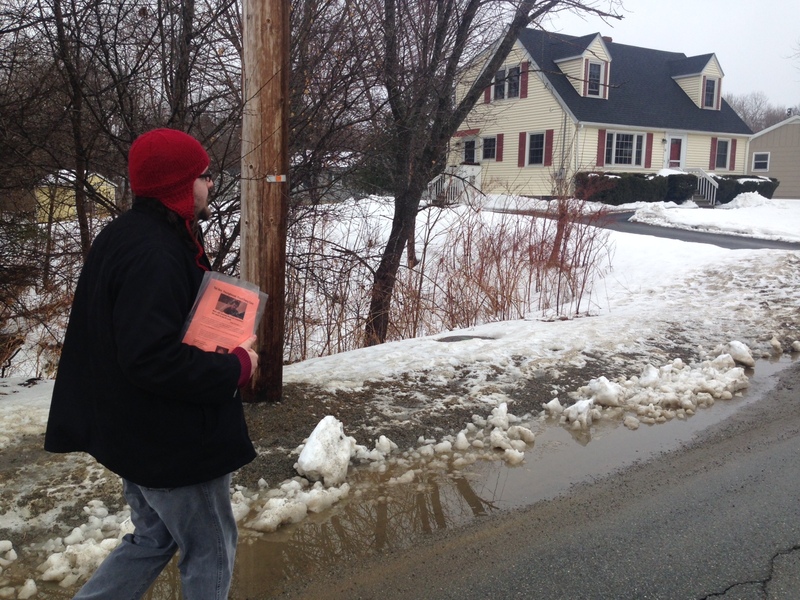 Maine People's Alliance members went door to door in neighborhoods in Brewer today to talk with voters about the campaign to accept the federal funds to expand health care to 70,000 Maine people and asked residents to contact their state Senator, Edward Youngblood, and urge him to vote to override the Governor’s expected veto of the bill. Participants gathered at Sunset Park to publicly launch the voter education canvass and urge Senator Youngblood to support the thousands of Mainers who are being denied access to health care. “Senator Youngblood has a clear choice: to continue to stand with Governor LePage and his politics of obstruction and deny critical, life-saving health care to Mainers, or stand with the overwhelming majority of Maine people and vote to make sure no one goes without the care they need,” said MPA Penobscot Valley Organizer, Amelia Mitter-Burke. “If Sen. Youngblood stands with Governor LePage and the legislature fails to accept federal health care funding, then this issue will be decided in November's election." For Susan Alexa of Bangor, the debate over health care in Augusta has direct consequences. A bill to expand health care for 70,000 people was passed with bipartisan support in both the Senate and House, but will require two-thirds support in each chamber to override a likely veto from Governor LePage. The fate of the bill, and health care for thousands of Mainers could be decided by only a handful of lawmakers. In December, a poll conducted by the Maine People’s Resource Center in key swing House Districts found that 69% of voters supported accepting the federal funds to expand access to health care. A majority of those voters indicated they would be less likely to support candidates who voted against health care expansion.